UKIP MEPs protest during EU anthem Jump to media player Nigel Farage has led his fellow UKIP MEPs in a protest against the European Parliament at the opening of its new session in Strasbourg. Cameron defeat 'like England team' Jump to media player UKIP leader Nigel Farage has hit out at David Cameron after his defeat in an EU vote over a new European Commission president. UKIP outline direct democracy plans Jump to media player Nigel Farage has said UKIP wants to give people direct democracy - with referendums to decide some policy. Tory MP recommends pact with UKIP Jump to media player A veteran Tory MP from Lincolnshire recommends a deal between his party and UKIP before the next general election. UKIP 'encouraged' by Newark result Jump to media player The defeated UKIP candidate in the Newark by-election says he is encouraged by the party's result despite losing to the Conservatives. Straw: Labour was wrong over UKIP Jump to media player Former foreign secretary Jack Straw has told BBC HARDtalk that Labour's approach to UKIP's political challenge was wrong. Farage: 'Thatcherism was of its time' Jump to media player Nigel Farage has denied that UKIP is attempting to be a new Thatcher party despite his praise for Margaret Thatcher's leadership. Nigel Farage has led his fellow UKIP MEPs in a protest against the European Parliament at the opening of its new session in Strasbourg. 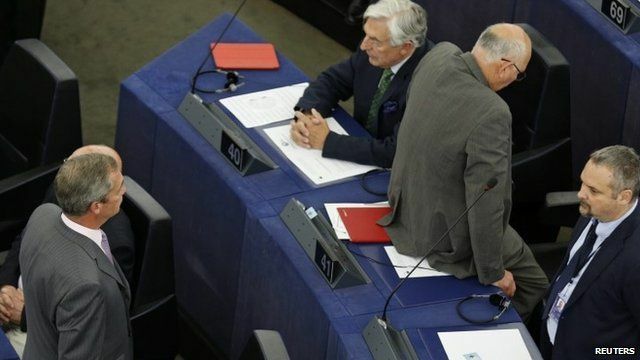 The UKIP MEPs turned their backs as an orchestra played Beethoven's Ode to Joy, the EU's unofficial anthem. Most of the party's 24 MEPs - the biggest delegation to the Parliament from the UK - are believed to have taken part in the protest.